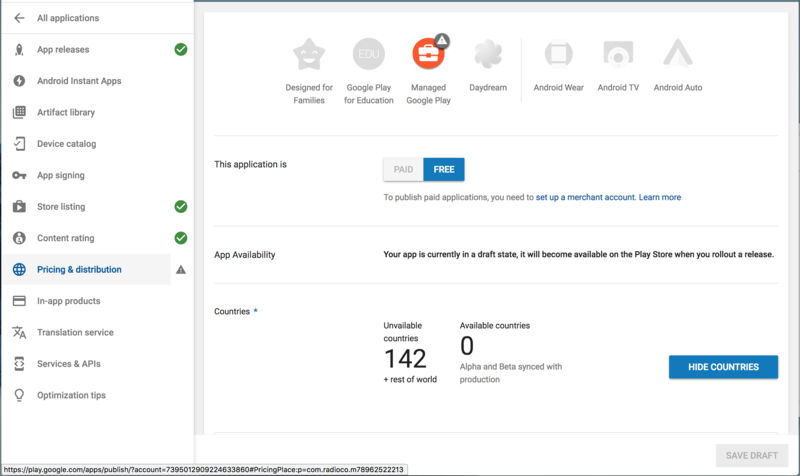 A step by step guide to submitting your app to the Google Play Store. Note: Track Artwork will not display on your device until we detect your App is live on Google Play. This is due to copyright reasons relating to artwork. It may take up to 48 hours from the time your App is submitted for artwork to display. Click CREATE APPLICATION on the upper right side of the page. Select your Default Language from the list and add your App Name (Title). Click CREATE. The Store Listing page will load. This is where you can enter specifics about your App. 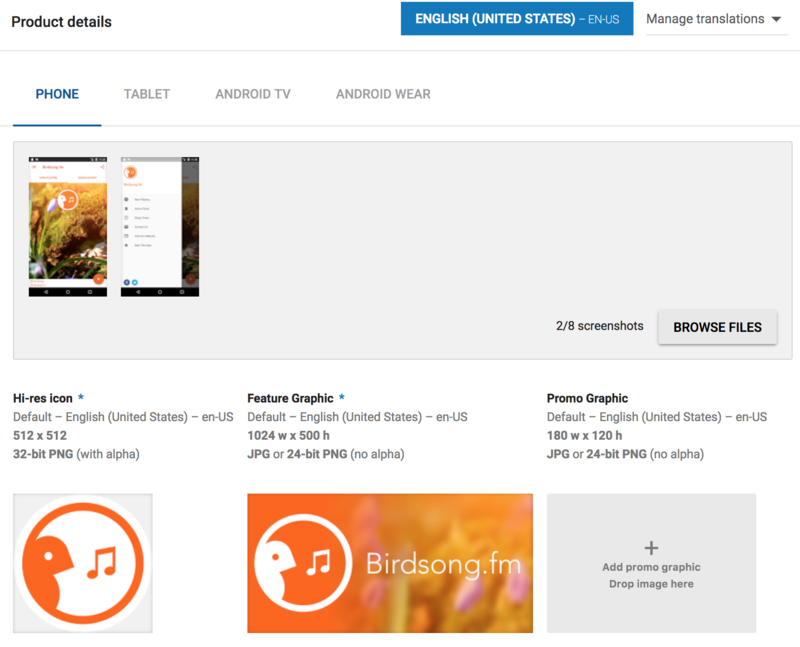 All this information will be displayed on your Google Play App page. Remember this page will be accessible to users of all ages. Please refrain from using profanity or adult content. Also copyrighted terms should be avoided (e.g. Apple, Google, Tunein.com). Enter the Full Description - This will be displayed on the actual App listing. Ensure you describe your App fully as it will be indexed and used for Google Play Store searches. 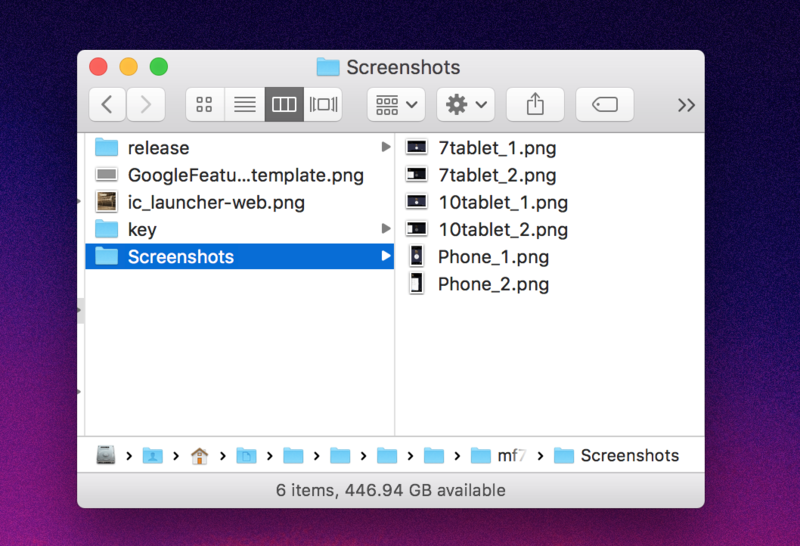 In this section, you ONLY need to upload assets on the Phone and Tablet tabs, Hi-res Icon, and Feature Graphic. Included in the Zip bundle within the Screenshots folder you will see at least 2 screenshots for Phone, 7 Inch tablet and 10 inch tablet. (phone_X.png, 7tablet_X.png, 10Tablet_X.png). Upload these to their respective sections by dragging them over one by one. 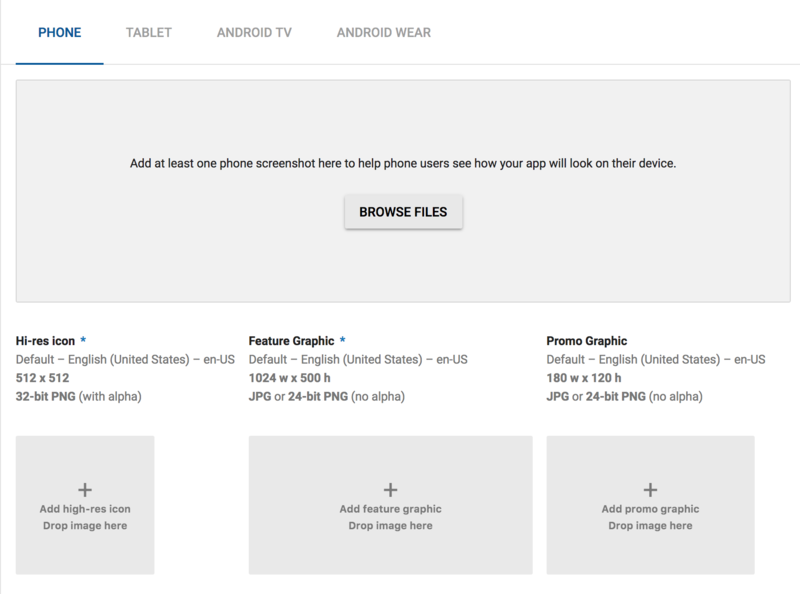 In the Feature Graphic section, upload a feature graphic. 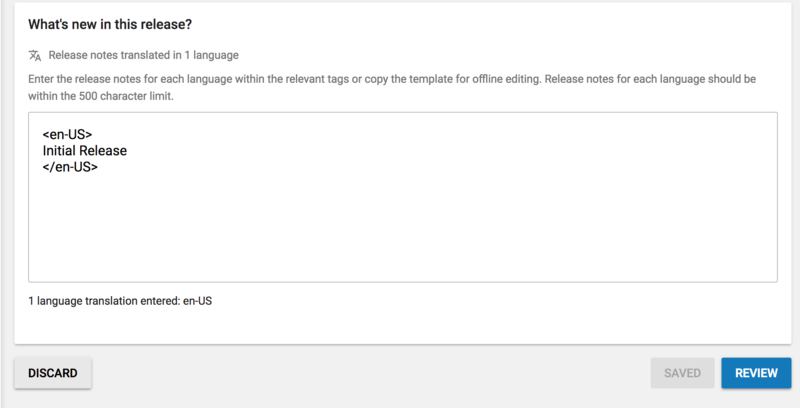 A template file (GoogleFeaturedTemplate.png) is included in the Zip bundle which is formatted at the correct size. Content Rating: Leave this for now. It will be completed later. Provide an email address and website. These will be displayed on the store listing so do not use a personal email address. If you wish to add a phone number, please enter using the international dialling format as per the example above. Once the above steps have been completed, click SAVE DRAFT at the bottom of the page. Click on App Releases in the Sidebar then click MANAGE PRODUCTION. On the next page click the CREATE RELEASE button. A new page will load. In the Google Play App Signing section, click OK. Then scroll down to the next section. 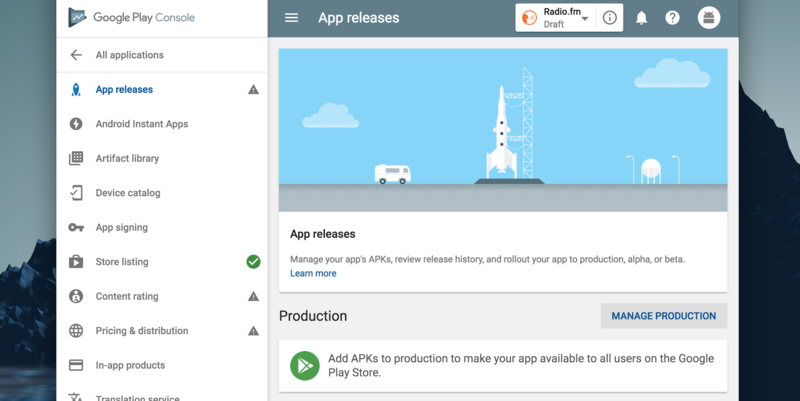 Click browse and upload your .APK file included in the Zip bundle within the release folder (app-release.apk). 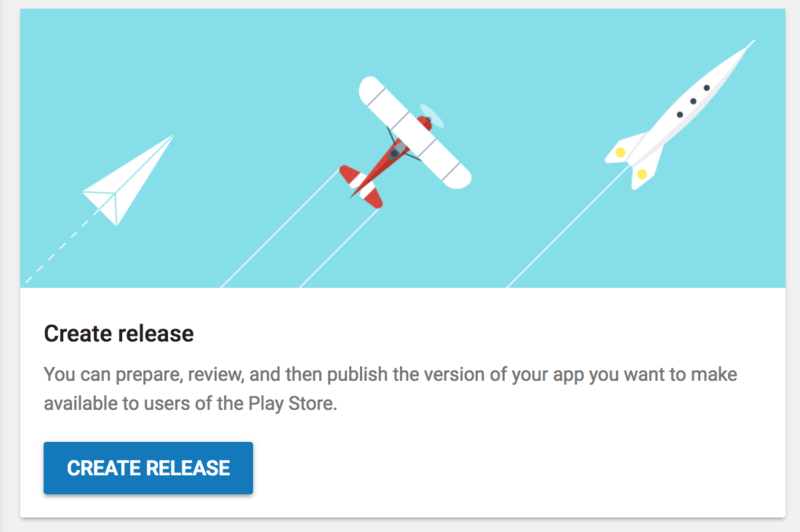 Once uploaded, give your App a Release Name (Typically just the name of your App. This is used to identify it in your developer account only). Next add a small paragraph about what's new in this release. This will be displayed on Google Play when users download your App. In our example we have used 'Initial Release'. Click SAVE then REVIEW at the bottom of the page. A green tick should appear in the sidebar next to App Releases. We will come back to this page later. In the sidebar click the Content Rating tab. On the new page click the CONTINUE button. Enter your email address, this is used for Google to contact you if they have any concerns over the content questionnaire. Please ensure the address is valid. This will NOT be shown on your public App page. Scroll down and choose the category of your App. 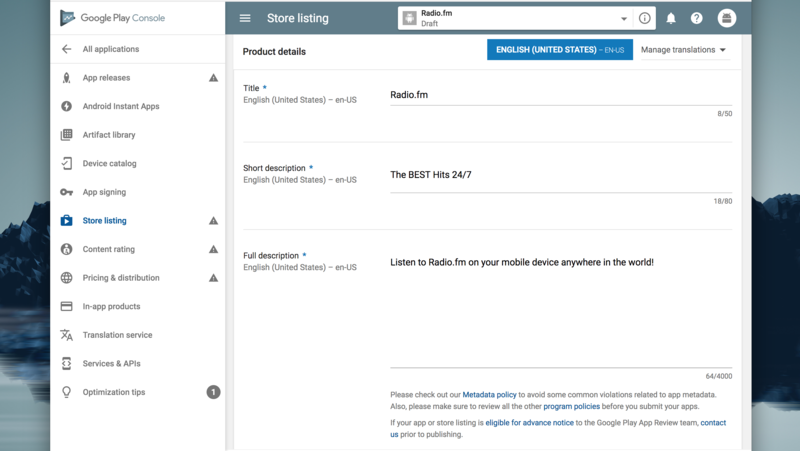 As it is streaming radio, you should select ENTERTAINMENT. This will expand the questionnaire. Note: If your station broadcasts mature content or profanity, please ensure you select the appropriate rating level. 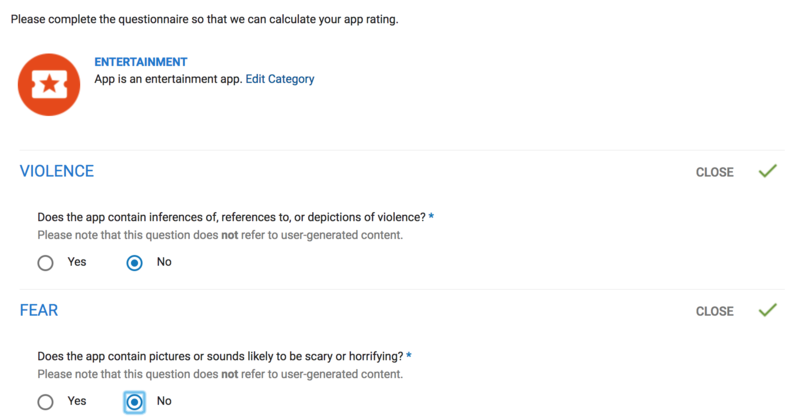 Your App may be banned from the store if you do not choose the correct rating. This is no fault of Radio.co. You will now be asked a series of questions relating to the content of your App. This relates to the content broadcast on your station, and any artwork used on either your website link or the actual App background/icon. The Miscellaneous questions at the bottom in most cases can be answered no. Answer each section honestly and click SAVE QUESTIONNAIRE. Once the page refreshes click CALCULATE RATING. This will show the ratings for all countries worldwide. Scroll to the bottom and click APPLY RATING. Your rating will be saved and a green tick will appear next to 'Content Rating' in the sidebar. If you want to provide your App as a free download, leave the first option on the page as it is. Choose which areas of the world you wish to distribute your App. If you wish to make it available everywhere tick Available at the top of the list. Device Categories and User Programs sections can be left as they are. 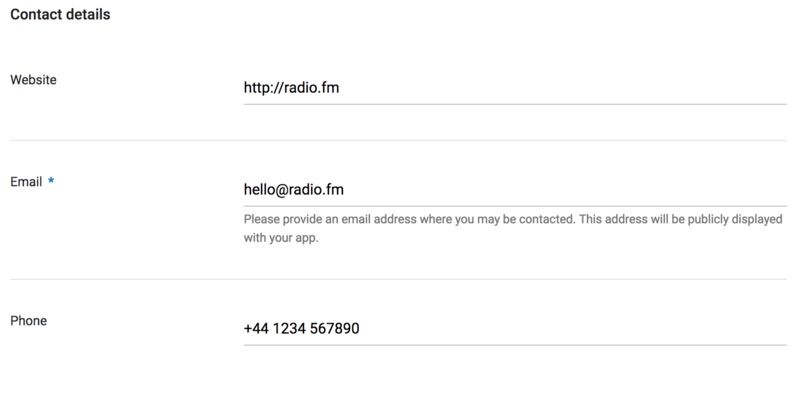 Radio.co Apps do not support any of these functions. 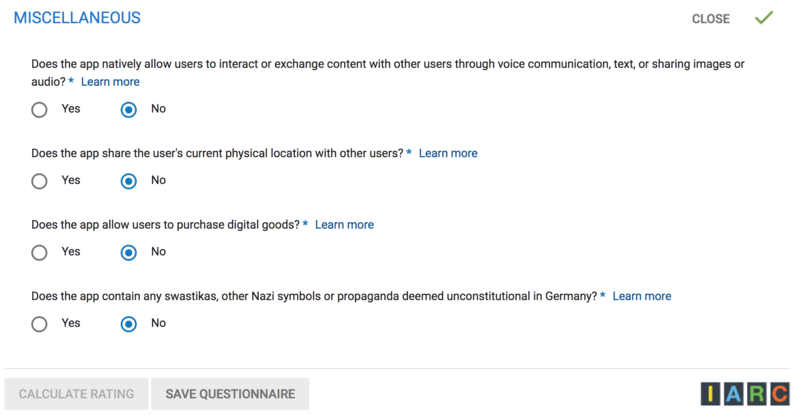 This section is where you agree to Google Play's terms for this App. 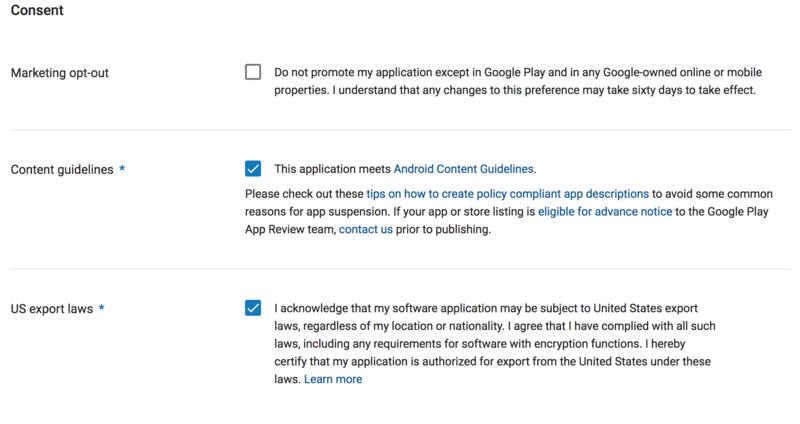 By checking the two required (*) fields you agree to follow the consent questionnaire completed previously and you understand that Google may remove your App or ban your account if any terms are breached. 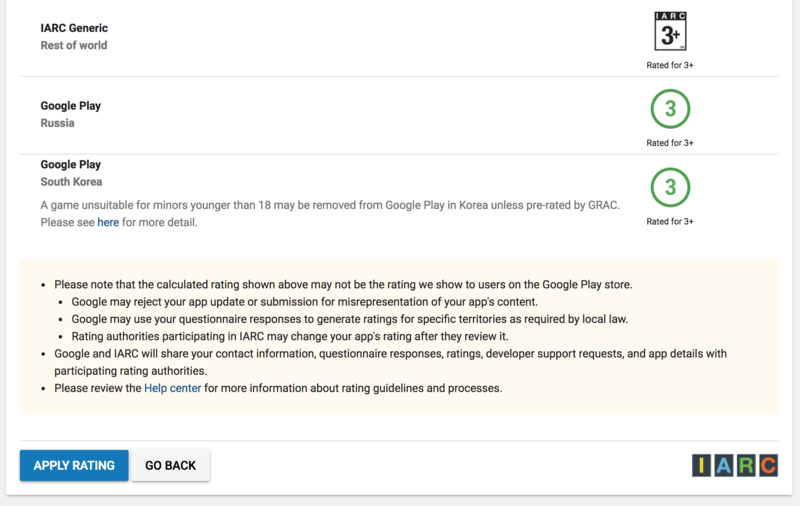 Radio.co is not liable if your App is removed from Google Play for any reason. Click SAVE DRAFT at the bottom of the page. A green tick should appear next to Pricing & Distribution in the sidebar. 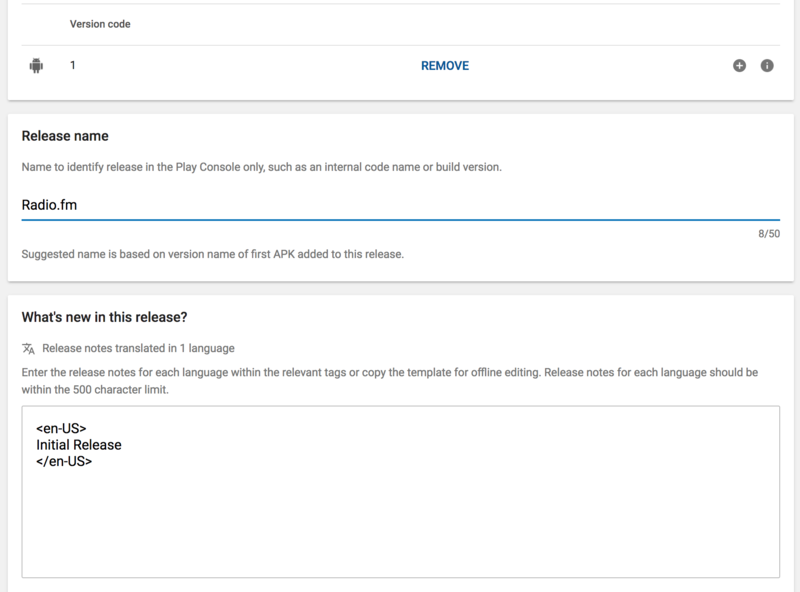 Head back to App Releases in the sidebar and click EDIT RELEASE. On the next page, scroll to the bottom and click REVIEW on the right hand side. On the next page click 'START ROLLOUT TO PRODUCTION' then click 'CONFIRM' on the popup. You will see a message saying that your app has been submitted and your app will be available in a few hours. We will mark your App as 'Live' in Radio.co within 48 hours. This will turn on Album artwork within your app and send your download link to your account email address.